Providing current and correct information and insights on specific Down syndrome effects on health. Your first words to a family have a lifelong impact. The first words to any parent should always be “Congratulations!” As a medical and health care professional you are in a position to create a lasting impression when speaking to the parents of a child with a determination of Down syndrome. The terminology and information you give to families must be fair and balanced. This resource was created to give you some practical ideas and suggestions on fostering a greater understanding when providing direction and speaking with new families. We welcome all medical professionals to reach out to CDSS via info@cdss.ca or 403 270 8500 to learn more about how to get involved. 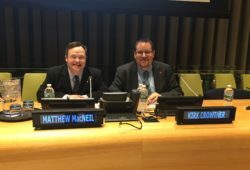 People with Down syndrome may face unique health complications beyond typical illnesses. Problems such as some congenital malformations of the heart can be life-threatening, whereas other conditions are not as serious. No individual with Down syndrome will have all these potential health complications, however, every child needs good preventative medical care. Teamwork between the family and doctors is vital to anticipate potential problems, and provide specific and individual treatment throughout their life, should they occur. Appropriate health care can greatly enhance the potential and life of individuals with Down syndrome. More than 40 per cent of children born with Down syndrome have a congenital heart malformation. Because of this high incidence, an echocardiogram is recommended. The diagnosis of a heart problem does not mean the baby is, or will become, seriously ill. The extent of heart problems varies greatly. Some degree of hearing loss, which is most often due to frequent ear infections, affects a high percentage of children with Down syndrome. Adequate hearing is critical to the development of good language skills, so periodic medical check-ups should include visualization of the ear canals to ensure no infection is present. Vision problems are also fairly common in many children with Down syndrome. An ophthalmological exam is recommended during the baby’s first year. You may have known before your baby’s birth that they have Down syndrome, or you may have found out after they were born. 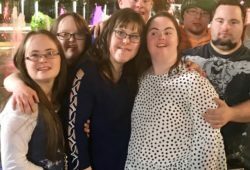 People with Down syndrome have extra genetic material associated with the 21st chromosome; how this genetic material will affect them is unique to them. There is no way of knowing how healthy your child will be, or how he or she will develop socially or intellectually, just as with all children! Down Syndrome itself does not require either treatment or prevention. However, the extra genetic material in your baby’s cells can affect their health so it is important that your baby is weighed to ensure they are gaining adequate weight as often babies with Down syndrome are smaller. Heart problems are common, including congenital heart disease (a heart problem present at birth). Every newborn with Down syndrome should have an EKG and an ECHO cardiogram before the age of four months. Many defects can be reversed with surgery. Your baby will be checked for any stomach and bowel problems. Most problems usually occur after birth and can be corrected surgically. You physician will also check your baby’s thyroid function, vision and hearing. It’s recommended within the first three to six months of your baby’s life that he or she is enrolled in an infant stimulation program to help your baby’s development. A developmental evaluation is recommended at one year-occupational, feeding and speech therapy can help determine your baby’s areas of strength and needs. Just as when your baby was a newborn, your doctor will weigh your child to make sure they are gaining proper weight. Many children with Down syndrome are prone to ear, nose and throat infections-if your baby has recurring infections, talk to your doctor about a referral to an ENT (ear, nose and throat) specialist. Some children with Down syndrome also have sleep apnea-problems with sleeping. Let your doctor know of your baby has problem sleeping or snoring. If your baby’s vision was not checked as a newborn, an eye exam should be done before your baby is six months old. Indications of poor vision are common among babies with Down syndrome, and can be determined through eye exams. Talk to your doctor if you suspect any vision problems. Regular visits to you physician can help ensure your baby’s health if there are any medical concerns. Your child with Down syndrome will grow and develop much like other children with Down syndrome. During This time period, there are some health concerns to be aware about. An annual check-up with your physician is important. Review with your doctor any infections, ear problems, constipation, eye problems or snoring (possible sleep apnea). Discuss with your doctor any possibilities of congenital heart disease, hypothyroidism, low caloric intake, etc. Similar to when your child was a newborn, annual thyroid tests are recommended. Ear tests are beneficial, especially if your child has a history of ear infections. Talk to your doctor about screening for Celiac disease, if your suspect your child has digestive difficulties. A neck X-ray at three to four years of age (and then again between 10 to 12 years old) can determine if your child has Atlanto-axial instability (instability where the neck connects to the spine). Radiographic screening is also recommended between ages two to three to assess for Atlanto-axial instability. Like other children, an initial dental exam before two years old is recommended, with a follow-up at six to twelve month intervals. A balanced diet and regular exercise programs are important to avoid childhood obesity. Continued speech and motor therapy assessments are beneficial to monitor your child’s development. A complete education assessment is recommended every three years, especially before your child enters school. Community supports like respite and counselling are available if beneficial to your family. Children with Down syndrome benefit from quality inclusive education settings, and the opportunity to learn from and with their peers. Early intervention programs used to identify and support the learning needs of each individual will ensure inclusion in our community schools. Your teenager should continue having annual physical exams, including a pelvic and pap smear for women with Down syndrome. Annual Eye, thyroid and hearing monitoring is recommended. Talk to your kids about smoking, alcohol and drugs. Your physician should refer an X-ray for Atlanto-axial instability at 18 years of age, and after the age of 30. A neurological exam can assess problems with seizures, and symptoms of dementia, which, in some individuals, can appear as early as 30 to 40 years of age. Twice yearly dental exams, a healthy balanced diet, and exercise are always important. Your child’s school program should include plans for employment, independent living, post-secondary education and sexual education. Attention to these issues can help ensure a life of contribution, engaged citizenship and meaningful relationships for your child. Vision: About half of children with Down syndrome have eye problems or vision loss. Eye exams from birth can ensure your child’s vision is properly monitored and supported. Heart: Congenital (defects existing from birth) heart disease occurs in many children with Down syndrome. It can be present even when a murmur is not heard. An ECHO cardiograph is worthwhile. Many children born with heart defects can have these reversed with surgery. Endocrinology: Individuals with Down syndrome commonly experience thyroid disease, which can occur at any age. Blood tests can best monitor that your child’s thyroid levels are normal. Hearing: Most children with Down syndrome tend to have small ear canals, making ear infections and structural problems common. Many children have some hearing loss, often due to fluid build-up. This can begin as early as the newborn stage. Regular ear exams can monitor your child’s hearing. A brain stem evoked response (ABR) is also recommended. This test measures responses in the brain waves that are stimulated by a clicking sound to check the central auditory (hearing) pathways of the brainstem. The National Down Syndrome Society (NDSS) is pleased to announce the release of its new publication, Aging and Down Syndrome: A Health & Well-Being Guidebook. The goals for this guidebook are to provide guidance, education, and support to families and caregivers of older adults with Down syndrome and to prepare them for medical issues commonly encountered in adulthood.